Hi! I finally got time to play with the FABULOUS Simon Says Stamp November Card Kit. It's beautiful. The patterned papers are especially lovely. This bird paper is a card in itself don't you think. I just added a simple sentiment from the gorgeous stamp set, stamped in Wet Cement ink (my new favourite ink by FAR! ), a button from the kit, and some ribbon and twine. beautiful!!! so romantic. I love the ribbon and the paper. Love your card and, yes, the November kit is already on my wish list. 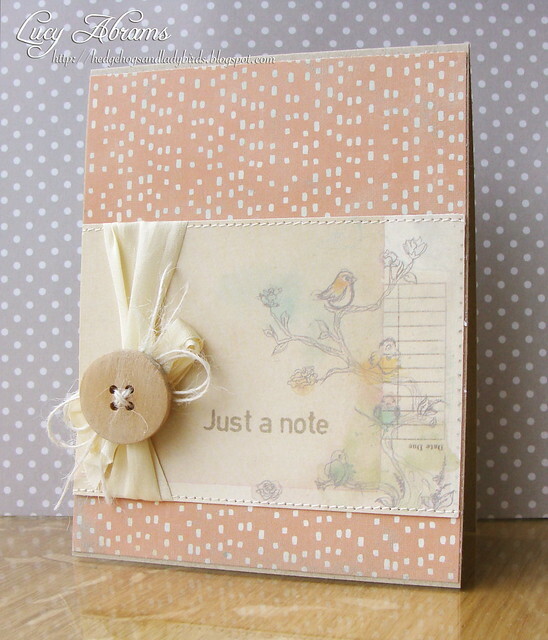 Gorgeous card and colors..love the button! What a great kit. I love the paper too. Fantastic card. This is so soft and pretty! I just love that paper you've used!